Though there is some doubt about whether McSorley’s Ale House opened exactly in 1854 or sometime near that year, at some point in the middle of the 19th century it did open. Founder John McSorley, an Irish immigrant, insisted his saloon, originally called the Old House at Home, was opened at 15 East 7th Street in New York City in 1854, while city records state that the building it occupies didn’t exist before 1858. At any rate, the place has been around for a while. One of the establishment’s slogans is “We were here before you were born.” This wasn’t always true, but it’s certainly true today. Their second slogan is “Be Good or Be Gone.” Bars don’t mind drunks, but rowdy drunks are just bad for business. At one time, McSorley’s had a third slogan: “Good Ale, Raw Onions, and No Ladies”. It’s certainly true you could always get good ale there, and raw onions are still available as part of the cheese platters the saloon offers. And these days, ladies can be found at McSorley’s, too—but this wasn’t always the case. McSorley’s was founded as a men-only pub. This was not uncommon in the United States and Canada in the 19th century. It was considered unseemly for a woman to drink or to smoke, so bars were thought of as no place for a woman. With the arrival of Women’s Suffrage in 1920, it’s conceivable that women might start pushing back against places like McSorley’s. There was no such pushback against McSorley’s in 1920, but the bar was facing its own problems since Prohibition was passed in 1919. McSorley’s, being a popular hangout for policemen and New York City politicians, felt comfortable flouting Prohibition from the beginning. Prohibition was never very popular in New York anyway, and the city’s power brokers weren’t too happy about the thought of losing one of their favorite hangouts. This clout with the powerful and the connected afforded McSorley’s a certain immunity, so the bar stayed open. The Fidelio Brewery, located on First Avenue, did not enjoy the same fortune, and was forced to close. Fidelio was McSorley’s supplier of beer, and an ale house without a beer supply is going to have trouble finding a reason to stay open. Somehow, they had to find a product to sell. Salvation came in the form of Barney Kelley, a retired brewer. (Because of Prohibition, there was suddenly a lot of retired brewers.) Kelley produced ale in washtubs in his own basement, and it arrived via barrel at McSorley’s. 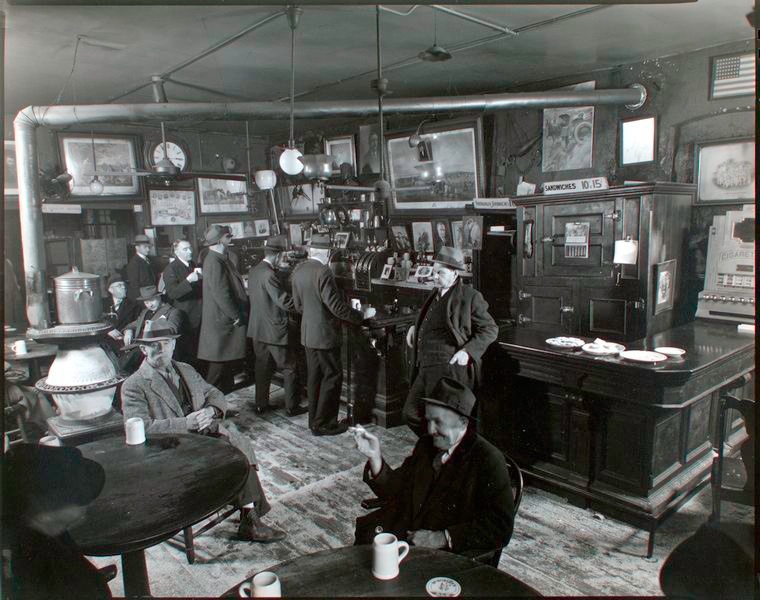 Founder John McSorley had died in 1910, so the bar was owned and operated by his son Bill. Bill felt that Kelley’s ale was too strong, so he watered it down, while raising the price to an incredible 15¢ a glass (or two for 25¢). To put things in perspective, a glass of beer in New York typically sold for 10¢ a glass even twenty years later. Still, loyal customers kept coming to the bar, despite the high prices and watered-down fare. Bill McSorley himself referred to the watered-down product as “near beer”, almost as if daring his customers to take offense. They did not. Speakeasies opened up all over the United States for people who still wanted a place to drink. Speakeasies could be back rooms kept invisible to the public (and to law enforcement). They could also be the one-room apartment of someone who has a couple bottles to sell drinks from. It’s difficult to think of McSorley’s as a speakeasy, since it was so brazen. Men had no problem getting a beer there, and the establishment ran unimpeded all through Prohibition. In 1933, when the 18th Amendment was repealed and their business was legal again, there was no interruption in service. Women, who could always get a drink at a speakeasy, saw no change in McSorley’s policy. One thing that did change was the watering down of the ale. With so much competition all over the city all of a sudden, the quality of the product started to matter a lot more. McSorley’s Old Ale House, circa 1940. It still looks much the same. To this day, McSorley’s still brews its own beer (and no longer waters it down). It remained open continuously from its 1854(?) establishment date until now, apart from its closure in 2016 due to health code violations. It remained closed for one week, and promptly reopened. A contemporary employee of McSorley’s. Hey, that’s no man!